Jesensky John	· Computers & Server, Internet	· Comments Off on Converting From Traditional To Internet Faxing: Is It Right for You? Converting From Traditional To Internet Faxing: Is It Right for You? One of the most difficult things for business owners to do is adapt to changing times, especially when the times changing have been staples of business for decades. Technology is changing the way we behave. It is changing the way we do business. It’s a good thing, bring less expensive and more efficient strategies and solutions, but that doesn’t make it any easier to go with the flow accept those changes. One of the business functions that has seen the most rapid change, a change to near evisceration, is the fax machine. In the past, if you need to send a doc, you just went to the fax machine, dialed a telephone number and sent the fax. Well, that was the way it was supposed to work. More often than not, the paper would jam. The number wouldn’t dial. The ink would be too low. It was a necessary evil that every business needed, but that every employee dreaded. Along came the internet and technology gave us an answer to that dreaded fax machine by way of internet faxing. The barrier to entry in adapting internet fax over traditional fax machines is very minimal. The staple of the fax is the phone number you use to receive faxes. Most businesses have this number printed on business documents so changing the number would be a near disaster. It would result in losing some documents in the short term as people catch up to the fact that you have a new number. The online fax industry has made the transition simple by allowing you to use your existing number or Port in a number. Companies such as http://www.fax87.com is one such company. What about decreasing costs altogether? That too can be accomplished by switching to internet based faxing. You can eliminate your fax line altogether. Get rid of any leased equipment and save on paper and other expenses. With online faxing, you do not need to incur the hardwired expenses. Simply get a number from your online fax service, (some for as low as $1 a month), and you are done. It really is that easy. What Is The Biggest Trade Off With Switching? The biggest trade off in switching from the fax machine to an online fax is… no more lost faxes. How many faxes have you sent over the years? How many of those never arrive at their destinations? Fax machines were and still are notorious for this. With internet based faxing, there are no more lost faxes. 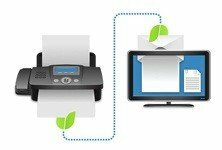 Taking advantage of technology for more efficient faxing is not only going to be the way of the future. It will be THE future. Technology as it is being created and evolving right now will most likely eliminate the need for a traditional fax machine ever again. Might as well adapt now, before you are forced too later.